A rich cream sauce made with butter, cream, and an abundance of Parmesan cheese. 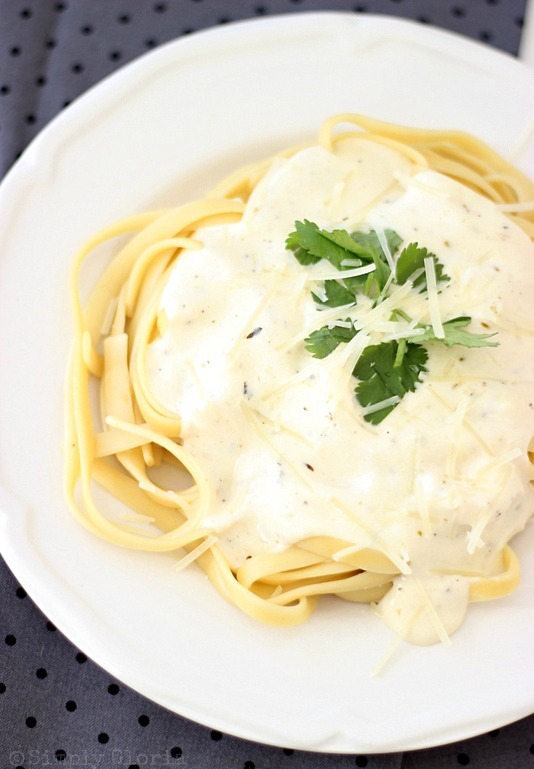 Parmesan Cream Sauce is the perfect go-to cream sauce for your favorite pasta! Quick and easy to make! I know exactly what you’re thinking. I don’t have time to make a cream sauce from scratch. 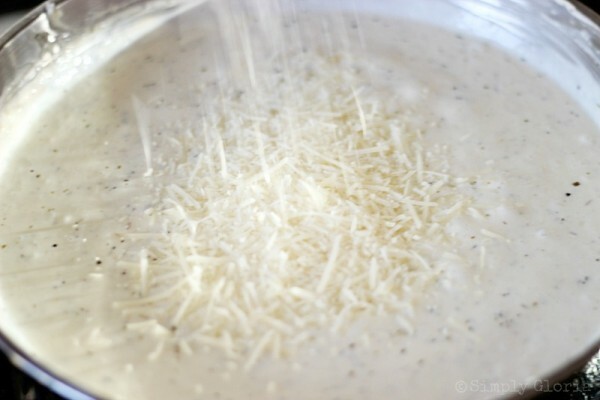 I’m telling you right now, if you have time to boil water and cook the pasta, you have time to make this Parmesan Cream Sauce… before the pasta is even ready to drain! Most importantly, it’s SOOOO good! You will fall in love with this sauce! It’s so creamy and cheesy-licious! I’m a saucy kind of girl, myself. And, my boys are huge fans of this cream sauce. Gatlon (the teenager of 6’1”) would choose to eat this everyday. Needless to say, it’s his favorite. 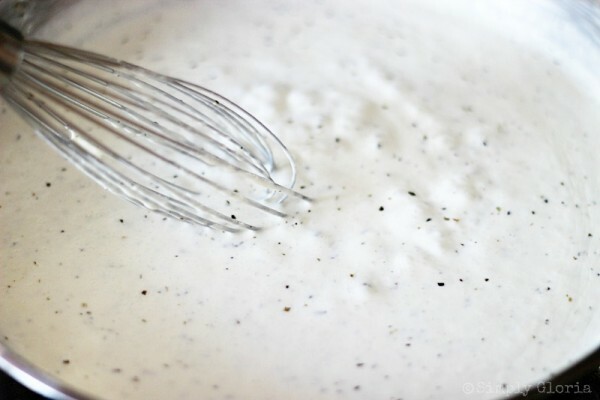 I want to share with you how to make my go-to cream sauce. It will blow your mind at how quick it is to make. I promise, after you make this, you will never go back to those pre made jars (or sauce packets) again! In a large skillet on medium heat, put in the cream cheese and butter. I have always preferred to using a skillet in place of a sauce pan. I feel I have more room for the sauce to do it’s thing! Immediately pour in half of the heavy whipping cream. I didn’t say this was a low calorie kind of sauce… just a delicious one! Sprinkle in the Italian seasoning, onion powder, garlic powder, and salt & pepper to taste. 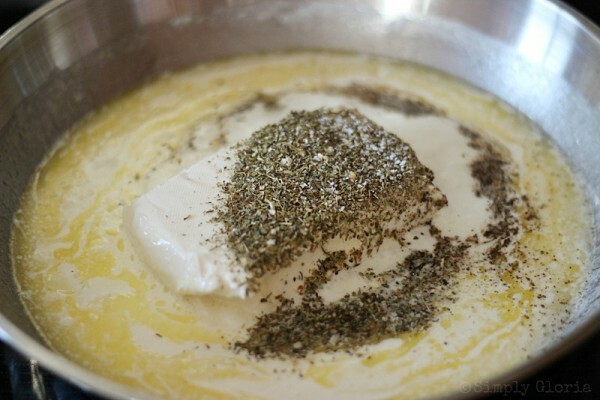 Whisk all together while the cream cheese is melting into the heavy cream and butter. You’ll notice the sauce will become very thick. But, keep whisking while pouring in the half & half. Add the rest of the of the heavy whipping cream and half & half. Whisk and simmer until the sauce becomes a creamy, medium thick consistency. Usually this takes a few minutes. The longer you let the sauce simmer, the thicker it becomes. If it gets too thick, add a tablespoon of half & half at a time. Now it’s time to stir in the grated Parmesan! And, the fresh shredded Parmesan. So easy. Even a 7 year old can be your helper! A rich cream sauce made with butter, cream, and an abundance of Parmesan cheese. 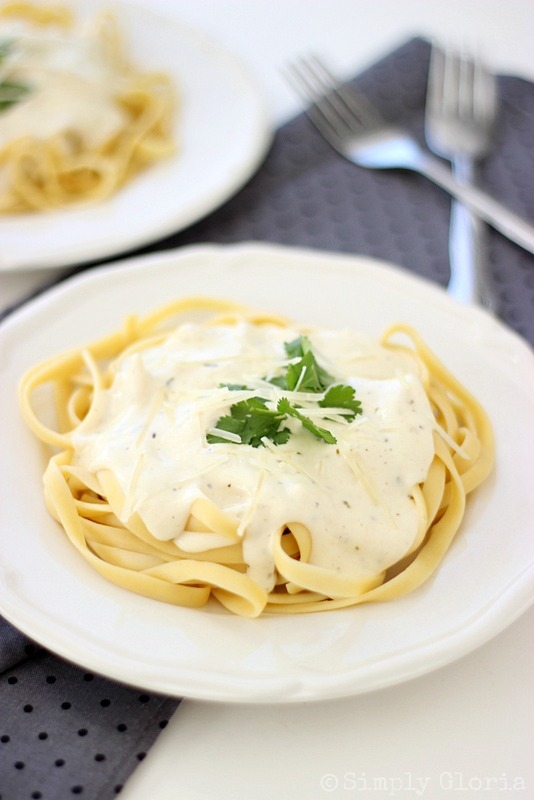 Parmesan Cream Sauce is the perfect go-to cream sauce for your favorite pasta! Quick and easy to make! Makes about 4 cups of sauce. fresh parsley for garnishing, optional. In a large skillet on medium heat, put in the cream cheese and butter. 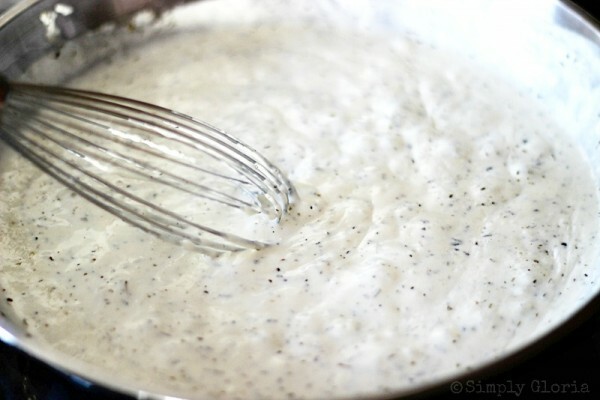 Pour in 1 cup of heavy whipping cream and seasonings. Whisk together until cream cheese has melted and all combined. It will be thick. Whisk in 3/4 cup of half & half and bring it to a simmer for a few minutes. Keep whisking! It will begin to thicken up. Add the rest of the of the heavy whipping cream and half & half. Whisk and simmer until it comes to a creamy consistency. Usually takes a few minutes. The longer you let the sauce simmer, the thicker it becomes. If it gets too thick, add a tablespoon of half & half at a time. Stir in the shredded Parmesan. Ready to serve over your favorite pasta! Start making this sauce as soon as you start the process of making your pasta. Everything will be done at the same time and ready to serve! Refrigerate any sauce that is leftover in a closed container for up to 3-4 days. To reheat, place in a pot on low heat, instead of the microwave. 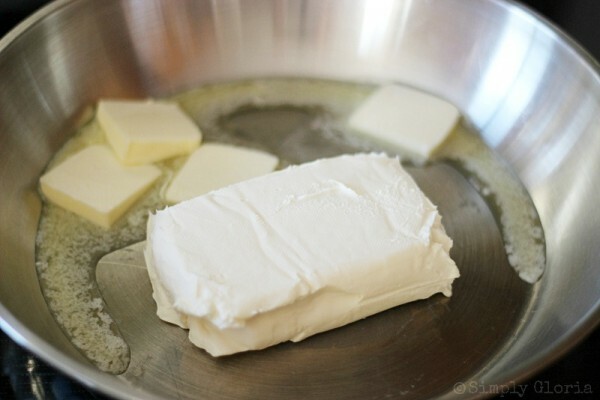 (The microwave separates the butters in the cream.) It will seem very thick when it is cold. But, as it warms up, it will become nice and creamy again. Remember, it's the cream cheese that is needing to melt again. 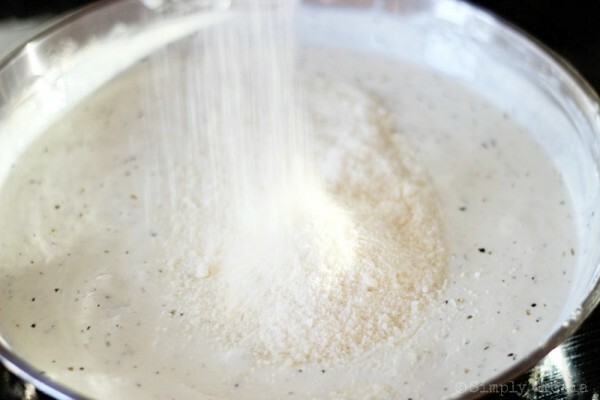 Add 1 tablespoon of half & half (or 2 teaspoons of milk) at a time to thin out the sauce when heating it back up, if needed. Remember, as long as it takes for your pasta to cook, you have time to make this sauce! If you have some leftover chicken (and bacon!) throw those in and make it a complete meal. The possibilities are endless! With me, it’s anything added to pasta itself! 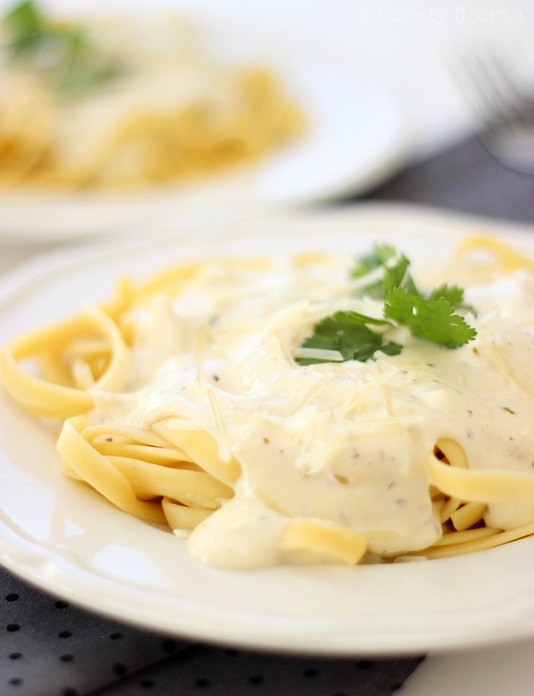 But, when my boys have a choice, it’s always this Parmesan Cream Sauce over any kind of pasta. « Super Bowl XLVII $500 Paypal Cash Giveaway!! I make homemade cream sauce all of the time but this version you made really knocks it out of these park! Looks fabulous and I bet is so good over pasta! This easy pasta cream sauce looks divine, Gloria! I am convinced that cream cheese makes everything taste better. 😉 Thanks for sharing, my friend! That sounds really good over asparagus, Michael! I’m going to have to try that next time. I love to bake it in with some fresh green beans. My boys laugh at me because I can’t even make the green beans stay healthy! This looks incredible, Gloria! I think that the cream cheese really helps thicken the sauce. I love having recipes like this to make on a weeknight when I don’t feel like cooking anything difficult but still want an impressive dish. Ashley, you’re right. It makes for a fast meal on the weekdays. This is why I make it all the time when my boys come home for *school* lunch. It’s fast and filling. Oooo, yum! Lin, you’re brilliant! Looks like heaven in a bowl!!! It looks amazing! I’m an ‘open up a can of sauce’ kind of person, but this may convert me!! I so agree with you, Kelly…. gotta love that cream cheese and butta! Cream makes everything better. This looks so tasty. This looks to-die-for, Gloria! Pinning, and putting pasta on my menu for next week! You’re going to love it, Samantha! Have a great rest of your day! Oh Yummy! 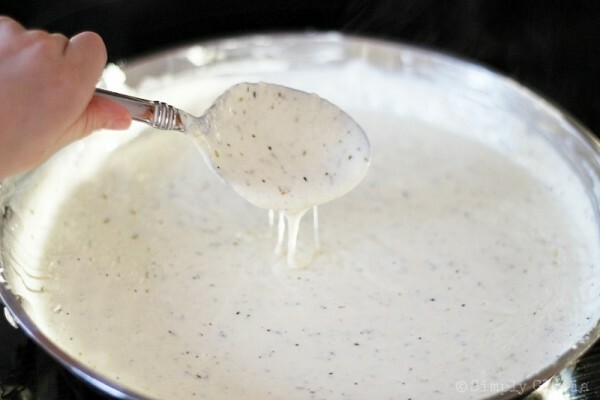 I love, love, love a homemade cheesy cream sauce! 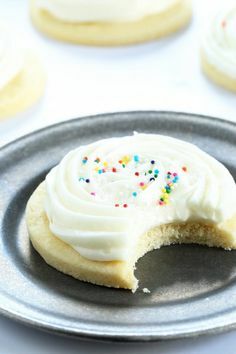 I can’t wait to try this one Gloria:) Pinning! You’ll love this one, Shannon! Thanks for pinning! Wow, not exactly diet friendly but I bet it’s amazing!! Why do you call for 1cup each grated and shredded Parm? Why not just use 2 cups of one or the other. It all melts into the sauce anyway? 1 cup of grated Parmesan is from the canister (the powder-like stuff) and shredded is in the usually in a container that has been freshly shredded or you may freshly shred a brick of Parmesan. 🙂 You may use 2 cups of one or the other. I feel it gives it more texture and flavor by using two different forms of Parmesan. Could you make this sauce and freeze it? i made this last night with some breaded chicken breasts and some angel hair pasta, it was fabulous, it actually made quite a bit, can i freeze some for later?? I love how simple this recipe is. I’m a bit of a creamy sauce addict (I have about a 50 – 50 blood to mac and cheese ratio). I’ve been trying to cut down on carbs a little more, so found this leeks in Paremsan sauce recipe if it helps anyone – https://www.recipestroupe.com/recipe-leeks-in-a-parmesan-cream-sauce-50702.html Still miss the pasta, but great substitute! This was the best parmesan cream sauce I have ever had¡!!! I had Shrimp & Parmesan Sirloin at one of my favorite Restaurants last week. I saw your recipe and had to try to make it myself. I used leftover Ribeye Steaks, poured your Cream Sauce over the Steaks and topped with Shrimp from a Shrimp Scampi I had in the freezer. Oh so Good!! At a fraction of the price!